The first full day of spring, and we are almost knee deep in snow. How did you spend your snow day? I frolicked with my dog and three other neighborhood dogs. Pure joy! I also watched two movies and spent as little of my time on my computer. Like a layer cake, the snow makes for some delicious hidden treats. One layer is encased with a crunchy top, another a semi-hard shelf. Two layers above that, is the layer that my neighbors snow blower created and finally, the last layer (but not the last), is the softest fluff. I wait for the drifts to scuttle across the field, and then dive in. I hesitate to go to deep because I like the hidden charms of a snow drift intact. I come up for air and find that night has settled around me, crisp, silent, and expectant. Time to go home. 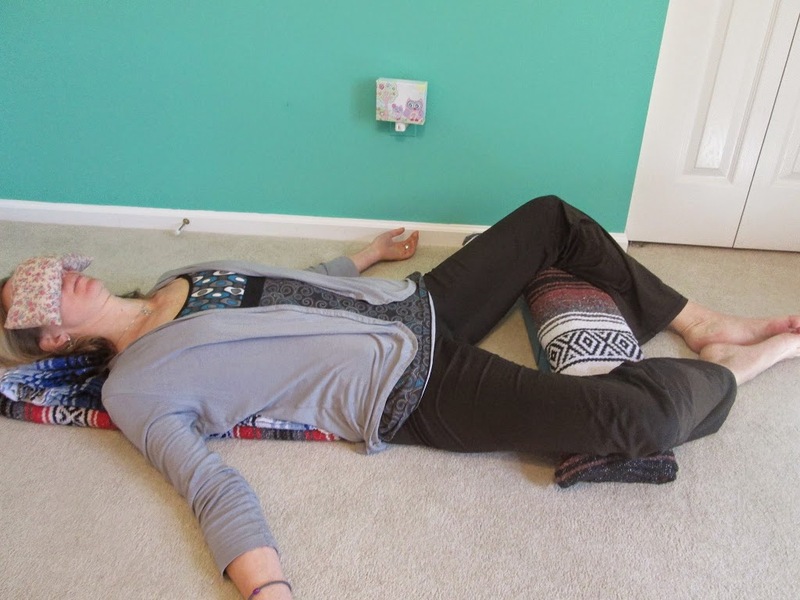 Lay one blanket down for the upper body and perhaps a neck rolls or another blanket for the head. Add a blanket out to the side to rest the bent leg on. Come onto your belly and bend one leg to a 90 degree angle, other leg is straight. Find a comfortable position for your arms (Goddess, by your side, or out to the side) and turn your head to one side. Stay for 5 minutes or more, turning your head halfway through. When you are read to release, bring the bent leg back and switch sides. 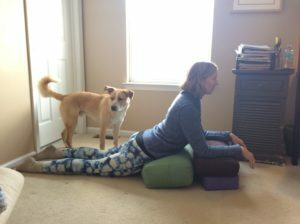 You may want to move back to Childs Pose between sides also. 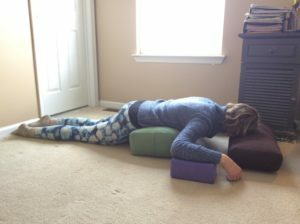 Place one bolster horizontally on your mat and the second bolster on two blocks also horizontally next to the first one. Add a blanket for the legs and possibly a neck roll or hand towel rolled up for the ankles. Come to All Fours and rest your thighs on the lower bolster, legs extended behind you. Chest is resting against the second bolster with forearms placed on the top of that bolster. Make sure that elbows are under shoulders and that you are slightly pressing down on inside of forearms so you are lifted out of the shoulders. Alternatively, rest forearms on the floor if they reach or prop them up with a blanket. Adjust for your comfort. This Sphinx position should be held for 2-3 minutes at the most. To move into the Childs Pose Variation, take the second bolster off the blocks and place the blocks to the side. Move that bolster further away from first bolster. Rest forehead on that second bolster and arms on the blocks, completely reclining. Stay 5 minutes or more. Adjust for your comfort.